Sleep is a vital part of life for humans and it acts as a reset button for our daily activities. It is a commanding signifier of the end of one day and the beginning of another, which is meant to refresh and re-energize us once sleep has concluded. However, sometimes it can be difficult for sleep to come to us as we lay in our beds at night. Everyone experiences trouble falling asleep occasionally but there are some people who consistently find themselves tossing and turning for long periods before unconsciousness washes over them. These individuals may be doing things throughout the course of their days that work to keep them up at night. Here are three tips that people experiencing fits of insomnia can employ to fall asleep quicker and easier. Blue light can significantly affect how well we sleep at night. "Caffeine should be avoided up to six hours before getting into bed." In today's modern, tech-based society, blue light is everywhere and is sometimes inescapable. It's emitted from cell phones, laptops, tablets, televisions, digital billboards and even energy-efficient lights. These blue wavelengths of light are beneficial to us in the daytime hours, because they can boost attention, reaction times and mood. They help to regulate our internal clocks and keep us awake during times when the sun is up. However, soaking in too much of this light at night will disturb a person's sleep schedule. According to The Sleep Doctor, blue light throws off our circadian rhythms, the body's natural sleep cycle, by suppressing the sleep-inducing chemical melatonin for periods twice as long as other light emissions. A study from the University of Haifa found that when healthy young adults were exposed to blue light between 9 p.m. and 11 p.m., they experienced shorter periods of total sleep time, less melatonin production and diminished sleep quality, characterized by more frequent awakenings throughout the night. The sleep-disrupting light in the study came from a laptop screen, and many of us engage with some sort of screen-based piece of technology just before bed. The blue wavelengths emitted from these devices could be preventing many people from getting a great night's sleep, but there are ways to limit the light's effects. 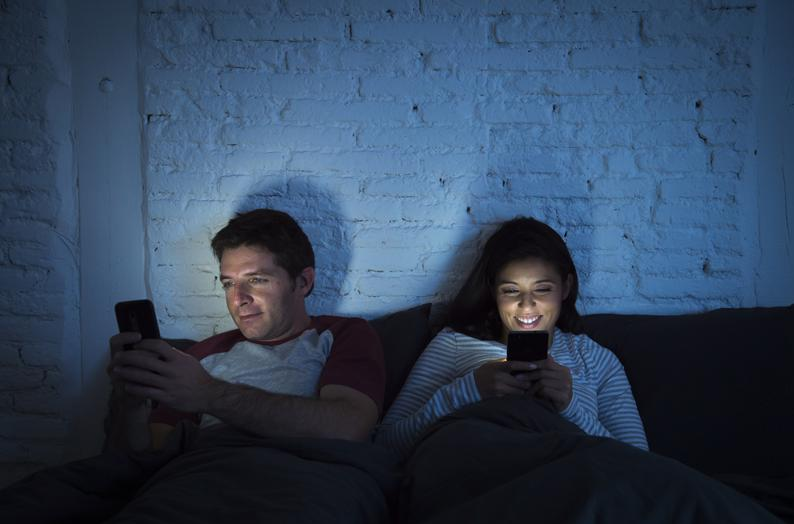 The first and most obvious solution to this problem is to avoid using a computer or mobile device immediately before falling asleep, although watching television may be acceptable. According to The Sleep Doctor, having a blue-lit screen directly in your face is more detrimental to sleep than looking at one from across a room. Device users can set a time limit for themselves based on their bedtimes that prevents them from looking at screens in the thirty minute to hour-long period before they get into bed. If this is not feasible, there is a wide variety of apps and programs for mobile devices and computers that adjust a screen's blue-light emission and turn it to a more sleep-friendly red hue. Many newer gadgets come with capabilities for filtering blue light already integrated. These systems can be configured to turn on during sunset and return to standard blue light emissions during the day. Trying to maintain a consistent sleep schedule is an important part of ensuring adequate rest is achieved each night. HelpGuide.org stated waking up and getting into bed at the same time each day helps to regulate the body's internal clock and can enhance overall sleep quality. People should choose bedtimes based on whenever they naturally feel their bodies getting tired. Many people experience drowsiness immediately after dinner, but sleeping during this time can greatly impede rest later that night. If you experience this, do an engaging activity like cleaning up, going for a walk or preparing clothes for the next day to fight off fatigue. Sleeping in on weekends is also discouraged because it can disrupt the body's normal sleeping patterns and create symptoms similar to jet lag. Major differences of more than one hour between weekend and weekday sleep regimens may worsen these symptoms and make it more difficult to rest in the days that follow. A daytime nap can help make up for certain losses in the amount of time slept without disrupting the principle sleep system. However, naps should be limited to 30-minute maximums and conducted in the early afternoon to prevent a potential inability to fall asleep later at night. As the sun sets and bedtime draws nearer, what a person chooses to eat can have a significant impact on how well they sleep. Healthline.com advised that people refrain from drinking large amounts of fluids in the one- to two-hour period before bed. This can cause nighttime trips to the bathroom that can disturb sleep and become a nuisance. Using the restroom right before bed can help prevent this problem from occurring. Caffeine should be avoided up to six hours before getting into bed. The substance is a stimulant that prevents the body from relaxing naturally and it can remain active in the blood stream for periods lasting six to eight hours. The more sensitive a person is to caffeine, the earlier it should be put down to ensure adequate sleep later that evening. Avid coffee drinkers can consume decaf in the afternoon and evenings to get the drink's taste without all the jittery side effects. HelpGuide.org also noted that smoking is another stimulant that could potentially disrupt sleep if performed right before bed. Eating a large meal at night and trying sleep shortly after may lead to restlessness and discomfort that prevents sleep. Eat burn, indigestion or feeling overly full can impede on rest, especially when foods are considerably rich, spicy, heavy, acidic or sugary. Sugars and refined carbohydrates such as white bread, white rice and pasta can make the body feel more alert and inhibit deep sleep. Consuming alcohol just before bed is also not recommended, as it can negatively alter the body's circadian rhythm. Sleep is cherished by many and its ability to readjust the body after a long day cannot be understated. Even though sleep is an action we do at night, it's something that should be considered throughout the entirety of our days leading up to it.